The condition for obtaining it is to "learn everything", so once you have gathered 99 archive items you will obtain it automatically. 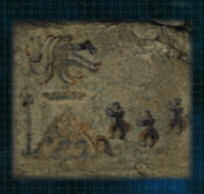 From this you can tell that it is important information to do with the very game's essence. It is a mural that was discovered during the Meiji period in the formerly forbidden-to-enter Irazu Valley. It clearly shows Datatsushi on top of a triangular rock that appears to be the Mana Stone. It depicts three people seeing this and fearing and honouring him. It is estimated to have been drawn in the latter half of the seventh century, so obviously centres on the taboo event that took place in 684 AD, when the residents of Hanuda Village (three people including Hisako Yao) were starving during a famine and are said to have "consumed the flesh of a god". According to "Nihon Shoki #29": "June - ceremony to bring rain. July - Comet appears in the north-west. Roughly three metres long." However, what this literally means is, "(in the area of land where Hanuda Village is) Famine due to drought. Residents are in so much trouble that they perform the "rain-calling" rites, and a comet flies past." The comet can also be interpreted as "a mysterious flying object falling from space". In that case, it strongly hints that Datatsushi, revered as a god, is a "being from another planet". 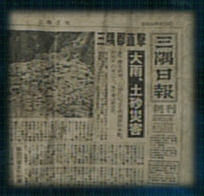 A newspaper article that details the landslide that hit Hanuda Village (3 August 1976 morning edition). The village at the time of the landslide, brought about as punishment for the failure of the "holy marriage rite", is described in chapter 3 of "Strange Tales of Hanuda". 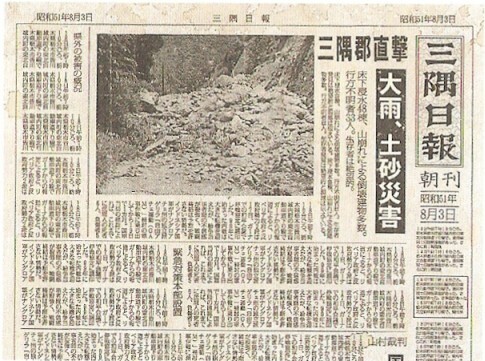 The article mentions that 33 people are currently missing, but in "Tales" chapter 3 the Misumi Daily Gazette (4 August morning edition) says that there are 31 people missing, two fewer people. As is written in "Tales" chapter 3, this is due to the discovery of the bodies of Toshio and Ikuko Yoshimura on the mourning of the 4th (the parents of the twins who later became Makino and Miyata). 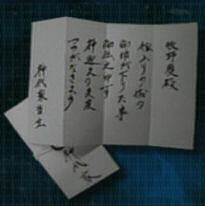 A letter notifying that the sign for the time of the marriage ritual for the "bride of god", Miyako Kajiro, has come (the beginning of menstruation). Receiving this notification the Makino house (Irazu Valley church) must begin preparations for the marriage ceremony within a few days. It is Shiro Miyata who is sent by the Kajiros to deliver the letter, as a member of the Miyata household of doctors who operate behind the scenes in the village. Incidentally, since Miyata, who bears complicated feelings towards his twin brother who operates on the "front" of the village, is so strongly backlit in the scene in which he delivers the letter, it is impossible to tell what kind of expression is on his face. 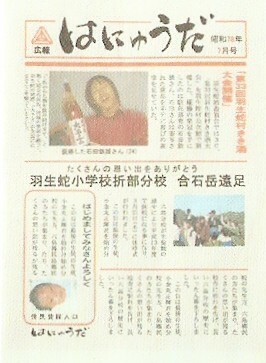 A public newsletter published by Hanuda Town Hall (July 2003 edition). 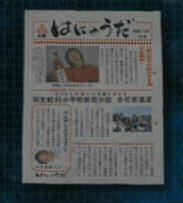 The main article is a report on the 33rd Hanuda Sake-Tasting Contest. The victor was village policeman Tetsuo Ishida. There is a large photo on it of Ishida speaking of his happiness at receiving a bottle of the local sake Daiyogen as his prize. Below it is an image of Harumi Yomoda's school Hanuda Elementary's field trip. 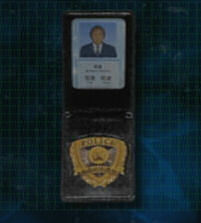 A new-style police ID. According to it, Ishida is ranked as officer. Kyoya obtains it quite early on in by the prefab hut in the construction site in Upper Arato. By obtaining it you will learn that the half-shibito policeman laughing creepily and shooting on a whim is the same officer Tetsuo Ishida smiling brightly on the cover of Hanuda News after winning the regional sake-tasting contest. The 33rd (1 July 1996) issue of the monthly idol magazine "BANG". It features a cover spread and gravure shoot with Naoko Mihama. At the time in '96, she had a role in the popular drama "Eat Your Heart Out". If she was once popular enough to have a gravure shoot with a magazine, she must surely have been unsatisfied at working on a low-budget occult show. 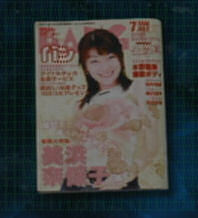 "BANG" itself is modelled on a real idol magazine called "BOMB!" (published by Genshuu Kenkyuu-sha). We had prepared an actual copy of it for shooting, and made our copy by putting a fake page inside it. There are actually more fun elements hidden within "BANG". If you look at the top half of the cover you can see "Masami Mizuno's Poppin' Body" - Masami Mizuno is the name of the actress who plays Yoriko Anno in the game.